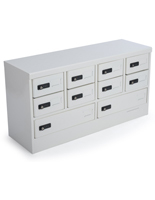 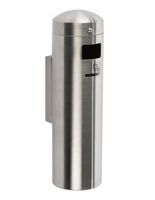 This outdoor cigarette receptacle keeps your commercial environment free of waste with a modern style that will complement any area. 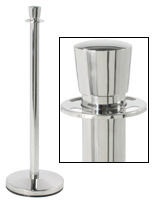 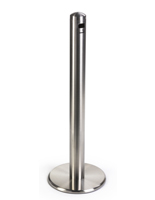 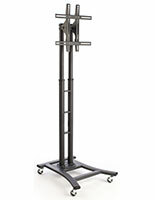 An iron base offers stability, but a lightweight stainless steel post provides durability and easy transport. 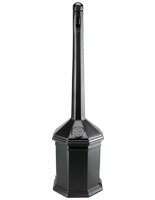 This modern cigarette receptacle has a black finish that is rust resistant to withstand rainy days outside a sports stadium, shopping center, airport or any public commercial zone. 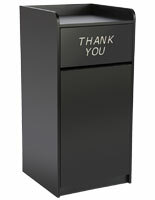 Each side of the smokers outpost has a hole to allow disposal options for patrons to place finished butts. 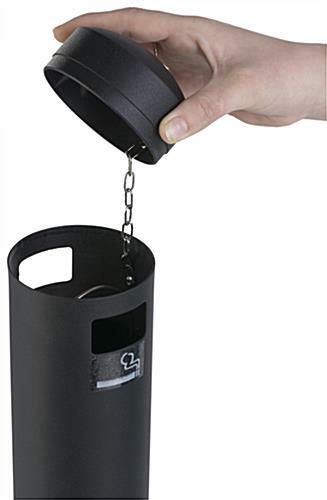 There is a liner inside to make discarding contents a simple and clean process with a chain attached to the cap to keep it from getting lost. 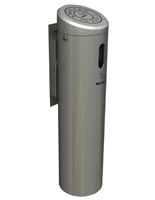 This cigarette receptacle snuffs out unwanted smokes and encourages disposal of the waste into the smokers outpost to create a clean, welcoming environment.